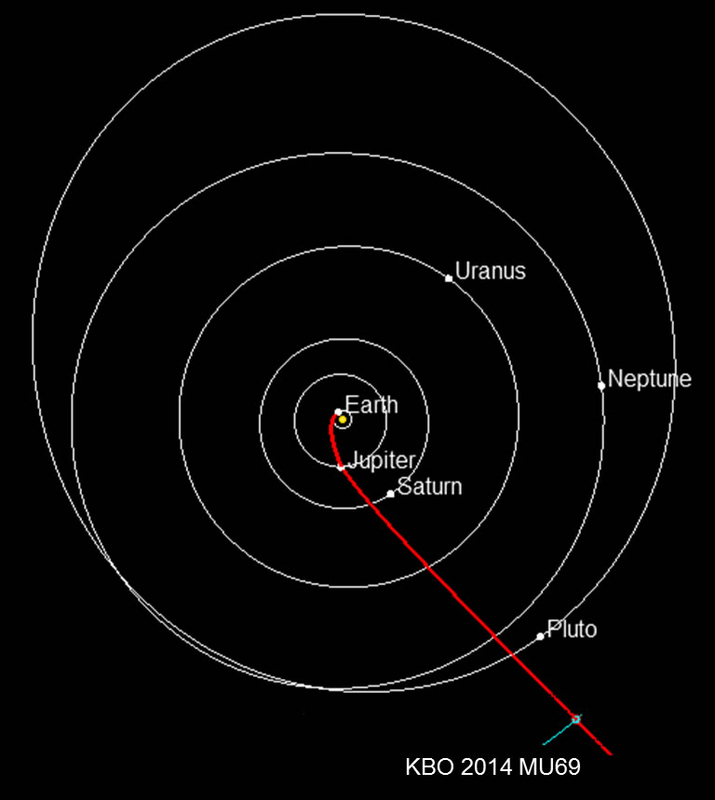 Path to a KBO: Projected route of NASA’s New Horizons spacecraft toward 2014 MU69, which orbits in the Kuiper Belt about 1 billion miles beyond Pluto. Planets are shown in their positions on Jan. 1, 2019, when New Horizons is projected to reach the small Kuiper Belt object. NASA must approve an extended mission for New Horizons to study the ancient KBO. NASA’s New Horizons spacecraft has successfully completed the third in a series of four maneuvers propelling it toward an encounter with the ancient Kuiper Belt object 2014 MU69, a billion miles farther from the sun than Pluto. The targeting maneuver, performed with the spacecraft’s hydrazine-fueled thrusters, started at approximately 1:15 p.m. EDT on Wednesday, Oct. 28, and lasted about 30 minutes – surpassing the Oct. 25 propulsive maneuver as the largest ever conducted by New Horizons. Spacecraft operators at the Johns Hopkins University Applied Physics Laboratory in Laurel, Maryland, began receiving data through NASA’s Deep Space Network at approximately 8:15 p.m. EDT on Wednesday that indicated a successful maneuver. Capping the series, the fourth and final KBO targeting maneuver is scheduled for Nov. 4. As the New Horizons team learns more about the orbit and location of MU69 – the KBO was only discovered in summer 2014 – it will plan additional maneuvers to refine the path toward the prospective flyby in 2016 and beyond. At the time of yesterday’s maneuver, New Horizons, speeding toward deeper space at more than 32,000 miles per hour, was approximately 79 million miles (127 million kilometers) beyond Pluto and 3.17 billion miles (5.1 billion kilometers) from Earth. The spacecraft is currently 900 million miles (1.45 billion kilometers) from 2014 MU69. All systems remain healthy and the spacecraft continues to transmit data stored on its digital recorders from its flight through the Pluto system in July.